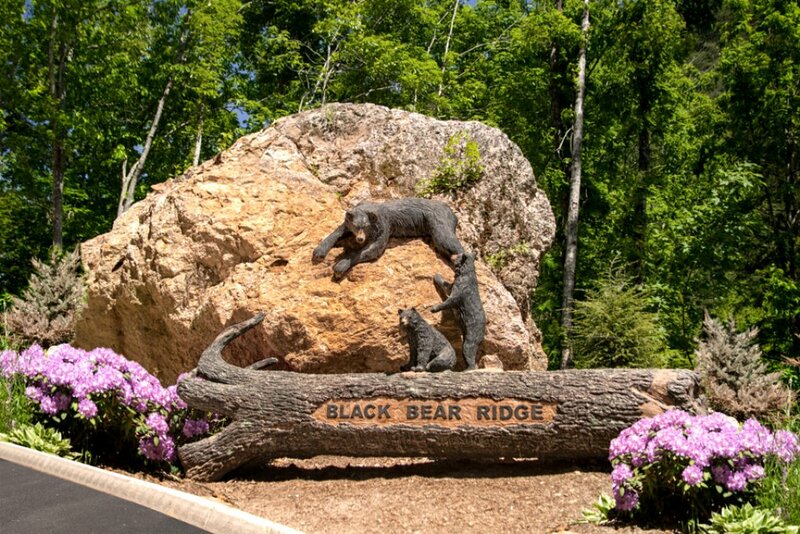 Rocky Top Retreat is just minutes from all the must-visit attractions of Pigeon Forge and neighboring Gatlinburg. 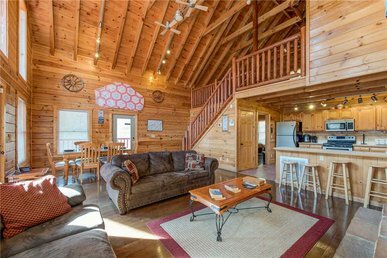 But there’s so much to enjoy in the three-bedroom, three-story log cabin, you’ll also have a great time just staying in. 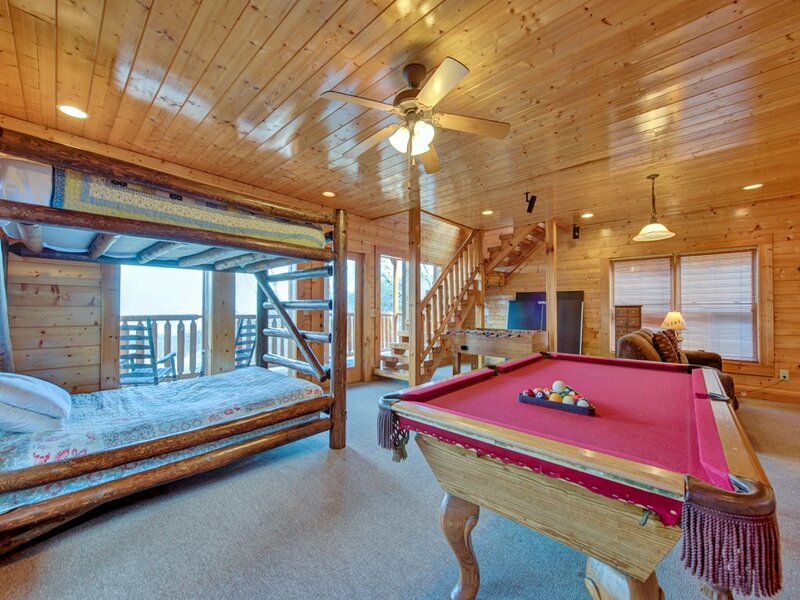 The spacious downstairs game room, for instance, features both a full-size billiard table and a foosball table. 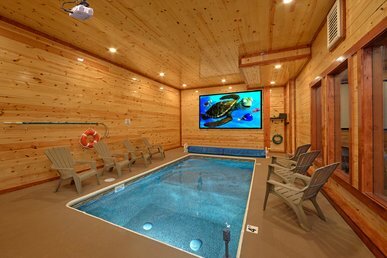 It has a large flat-screen TV too, along with a plush sofa where you can stretch out and indulge in a movie marathon. 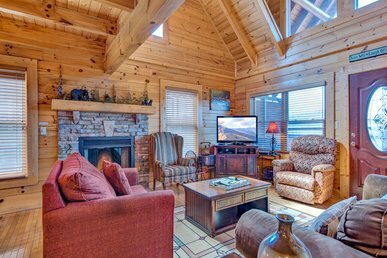 A second flat-panel TV—and more delightfully comfortable seating—can be found one flight up, in the main floor’s living room. 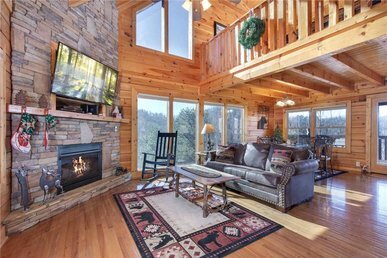 Whether you’re watching TV or not, you can enjoy the golden glow of the fireplace, which heightens the luster of the wood-planked walls, floor, and beamed ceiling. 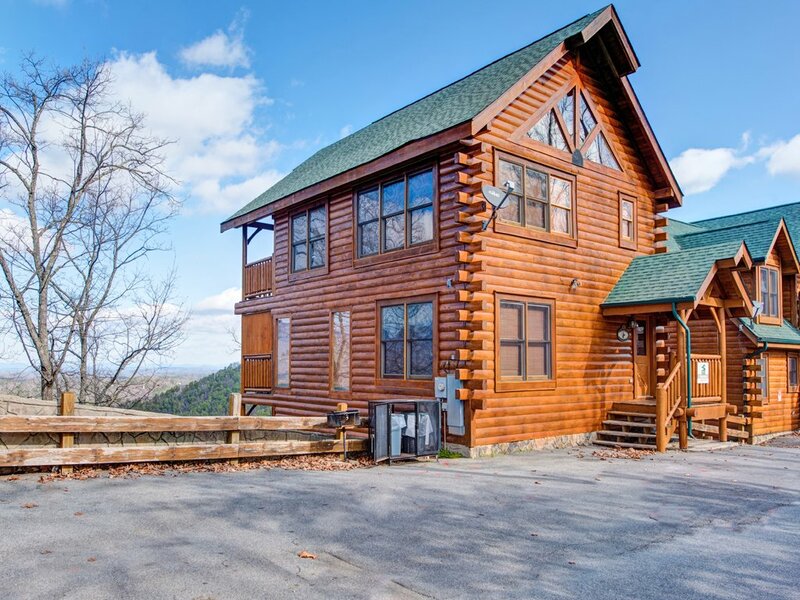 Large windows enable you to admire the Great Smoky Mountains while your sprawl out on the living room sofas or play a game with the kids at the dining table in the next room. 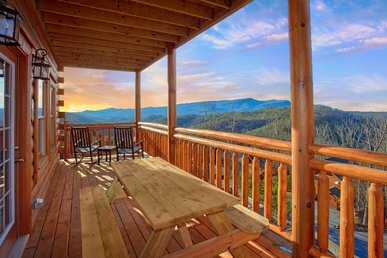 For an even better view of the mountains and the surrounding woodlands, head outside to one of Rocky Top Retreat’s three covered decks. 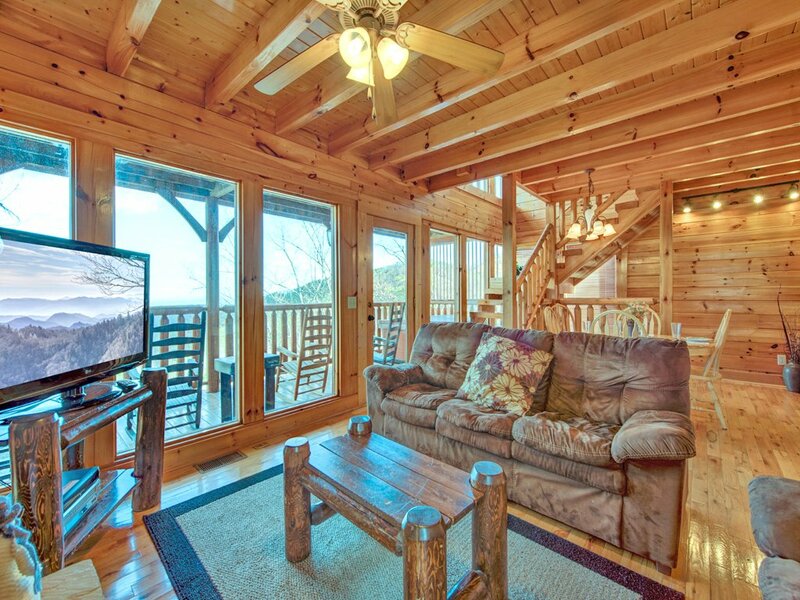 Totaling more than 800 square feet, the decks are furnished with rocking chairs—a must for any Smoky Mountain cabin. Bring your morning coffee outside and let the wrens and sparrows serenade you as you start your day, or longer under the star-studded evening sky before calling it a night. 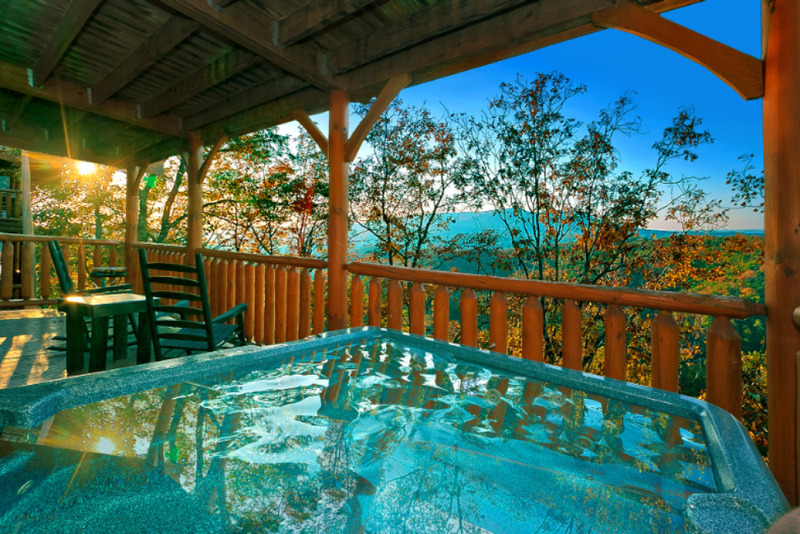 An even more luxurious way to revel in nature’s beauty is while lazing in the main deck’s hot tub. There’s nothing like watching the sunset over the mountains as jets of steamy water soothe body and soul. It’s a treat for the senses you’ll long remember. 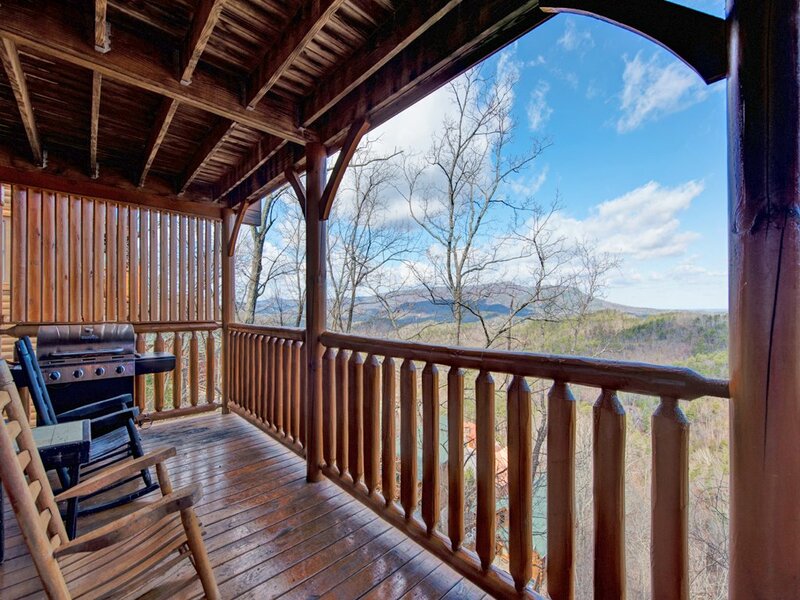 You can cook outdoors too, on Rocky Top Retreat’s gas grill. 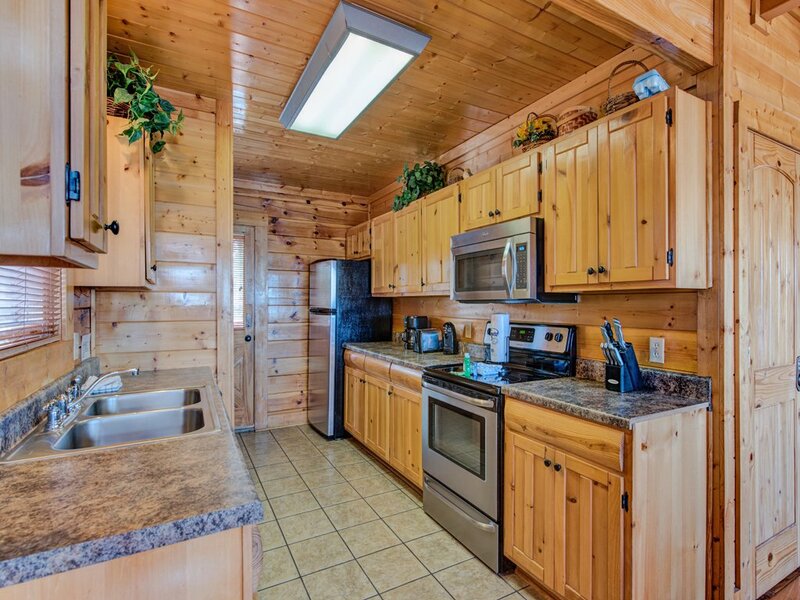 Of course, the cabin has a fully equipped kitchen indoors as well. Even if you dine out for most of your meals—and there are scores of restaurants just a few minutes away—you’ll love the convenience of being able to microwave popcorn or brew coffee whenever you want. And if you do decide to cook, you’ll find enough appliances, cookware, and tableware to prepare even a holiday feast. 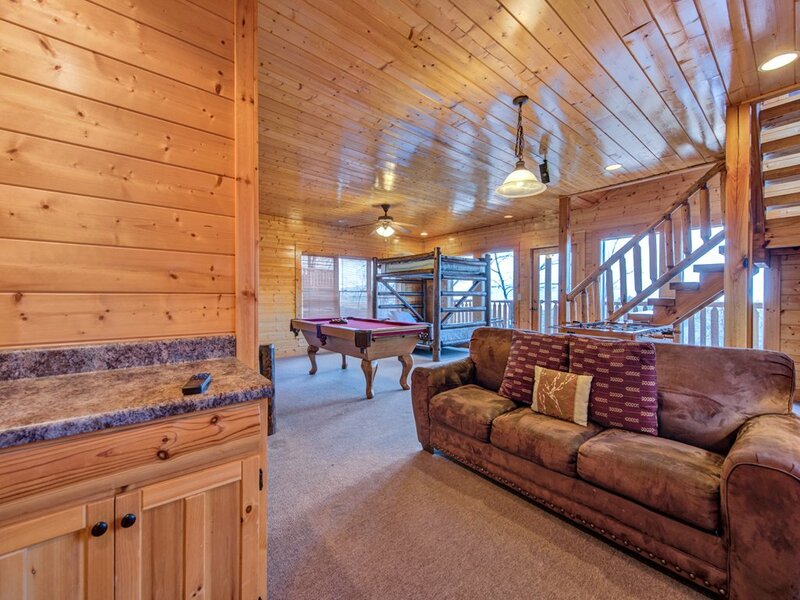 Rocky Top Retreat’s three bedrooms and three bathrooms are spread out, one on each floor. 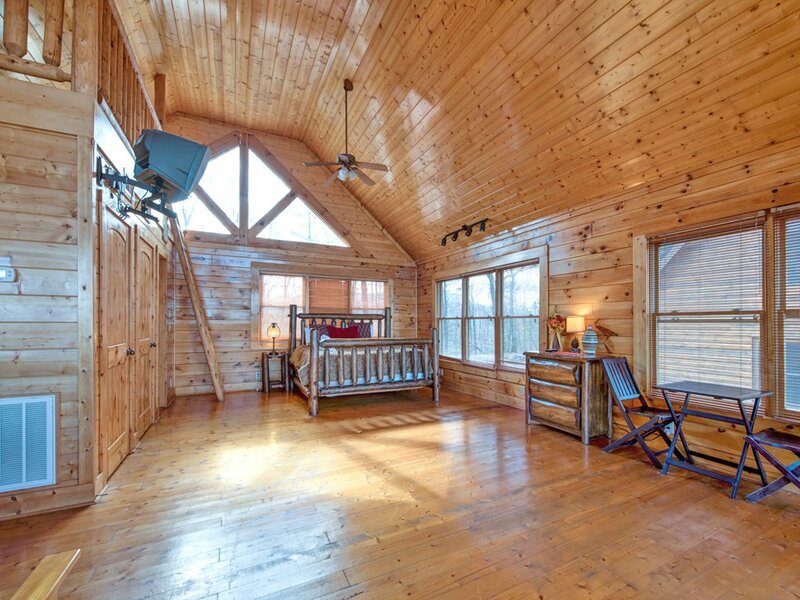 The upstairs bedroom is huge, with a king-size bed at one end and a futon that can sleep two more people at the other. 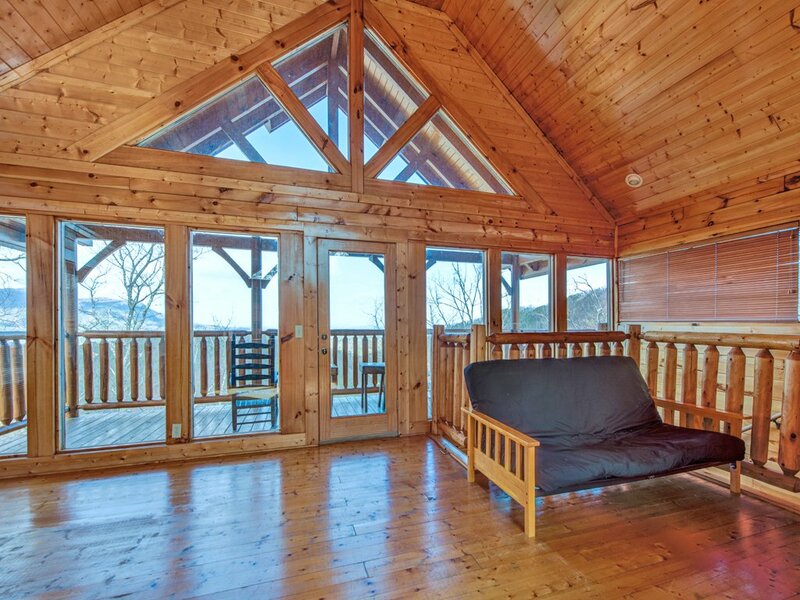 The room has a private deck as well, with a truly spectacular view of the mountains. 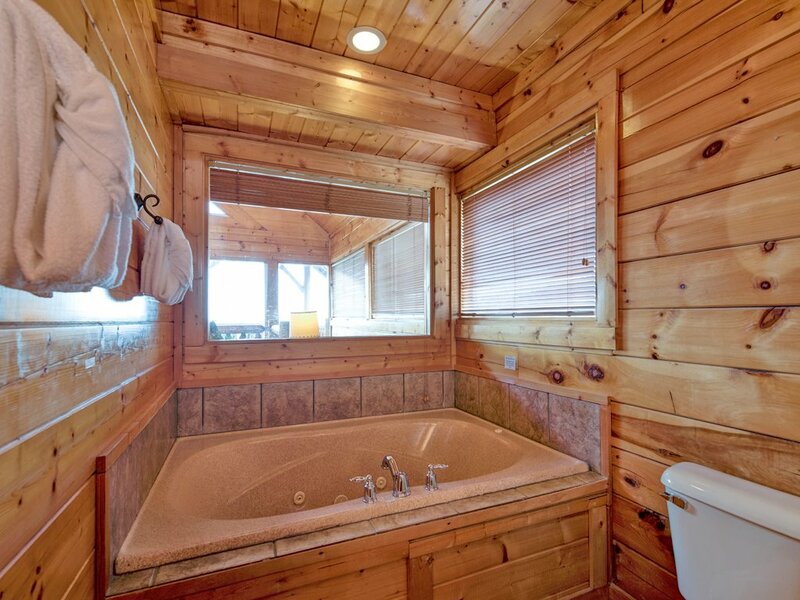 The en-suite bathroom includes an oversized soaking tub with its own stunning view. And a ladder from the bedroom leads to a loft that houses two more futons so that another two people can sleep there. 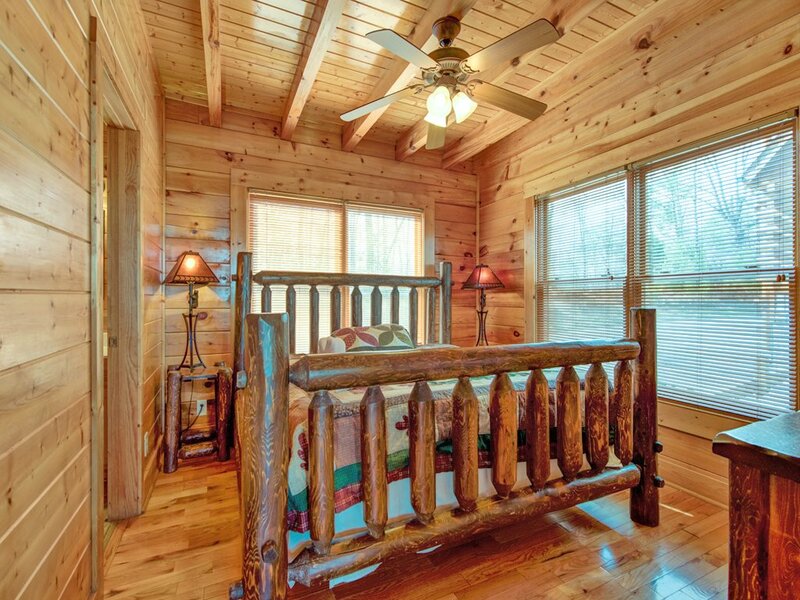 The main floor’s bedroom has its own private bathroom and log-frame king-size bed. 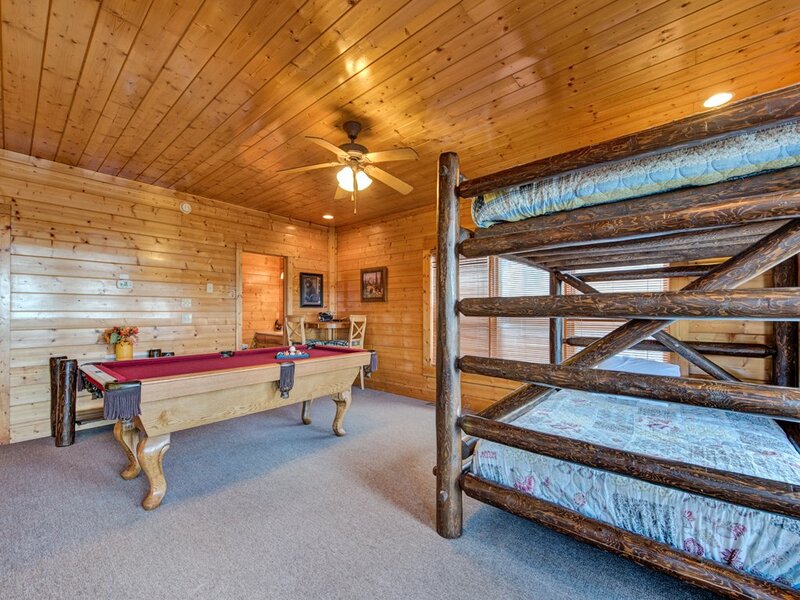 And the game room can sleep up to four people in the queen-size bunk beds. 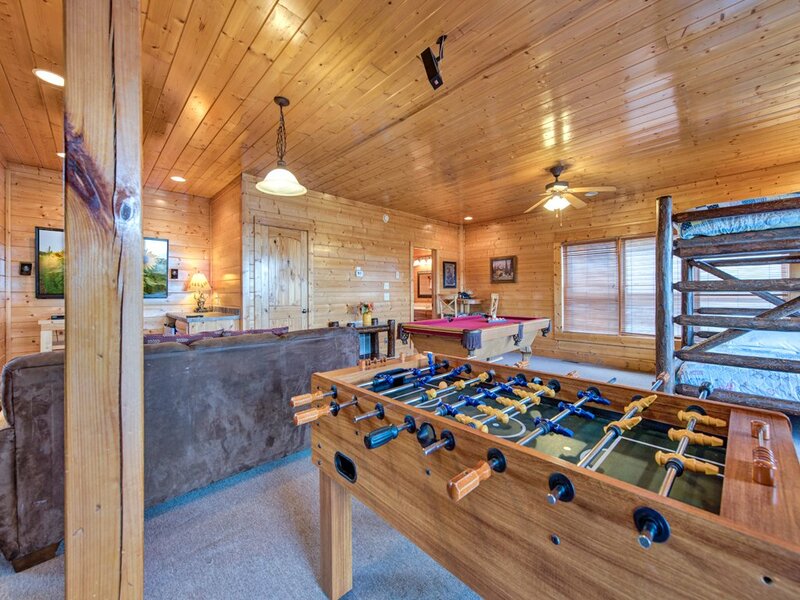 If there are kids in your group, they’ll probably beg to be allowed to sleep here; after all, who wouldn’t want a foosball table in his or her bedroom? 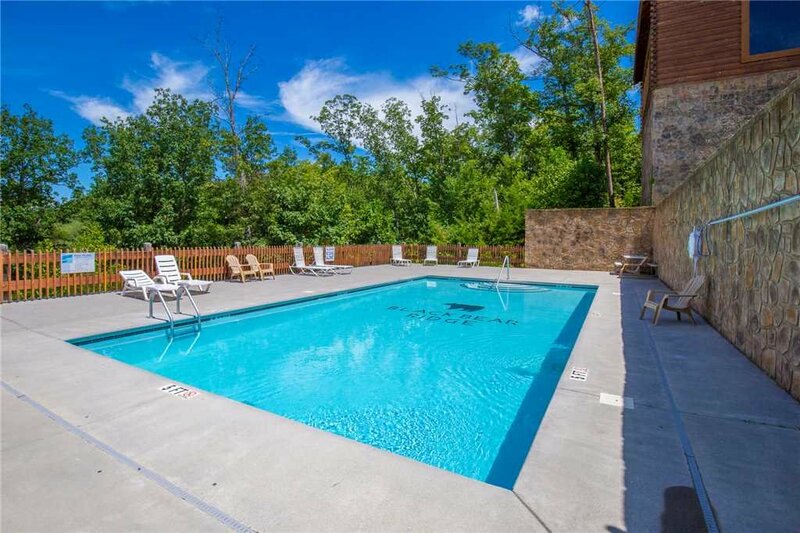 Rocky Top Retreat is located in Black Bear Ridge resort, which means that in the summer you’ll have free access to the outdoor swimming pool. 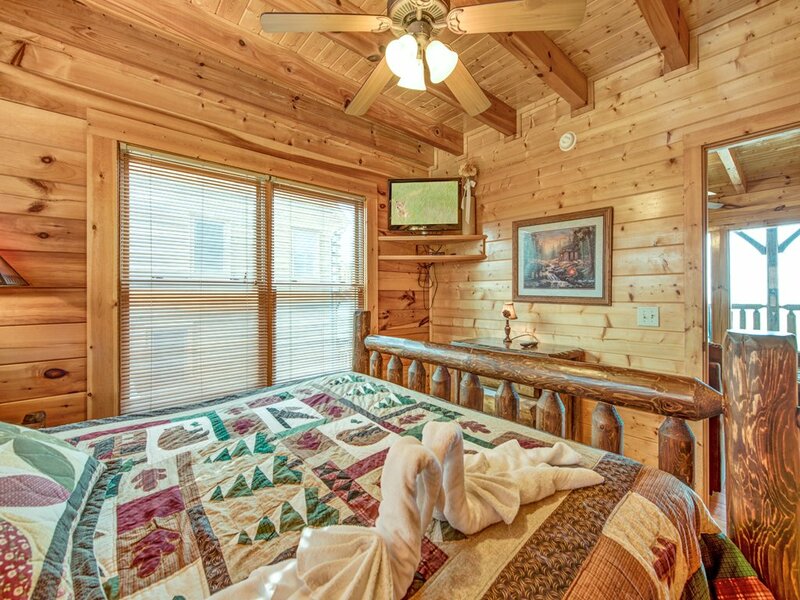 It also means that the cabin is just five minutes from the Pigeon Forge Parkway, the town’s main thoroughfare. 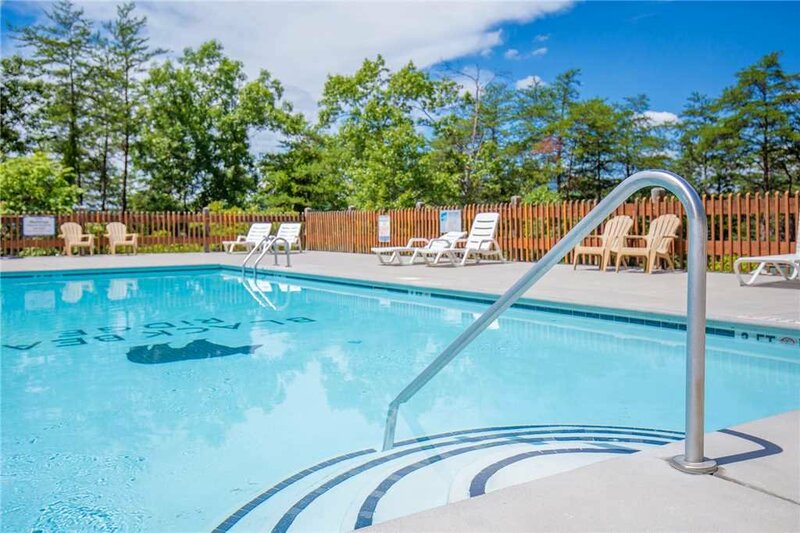 Dollywood, Splash Country, the Titanic Museum, outlet shopping, and more are just a quick ride away. 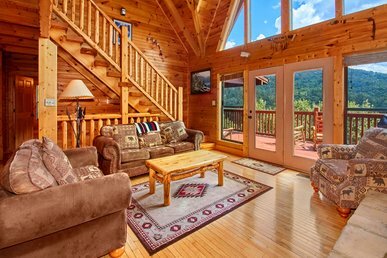 Drive just a few minutes more and you’re in Gatlinburg, home to the Guinness World Records Museum, an aquarium, thrill rides, and Ober Gatlinburg Amusement Park and Ski Area. And let’s not forget the Great Smoky Mountains National Park: No vacation in the area is complete without an excursion there. 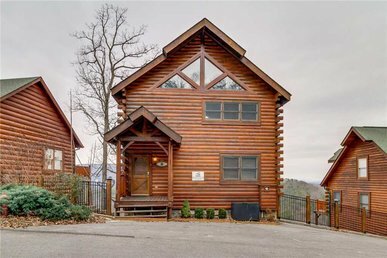 When you stay at Rocky Top Retreat, you really can do it all. First, though, you need to book your stay… before someone else beats you to it! 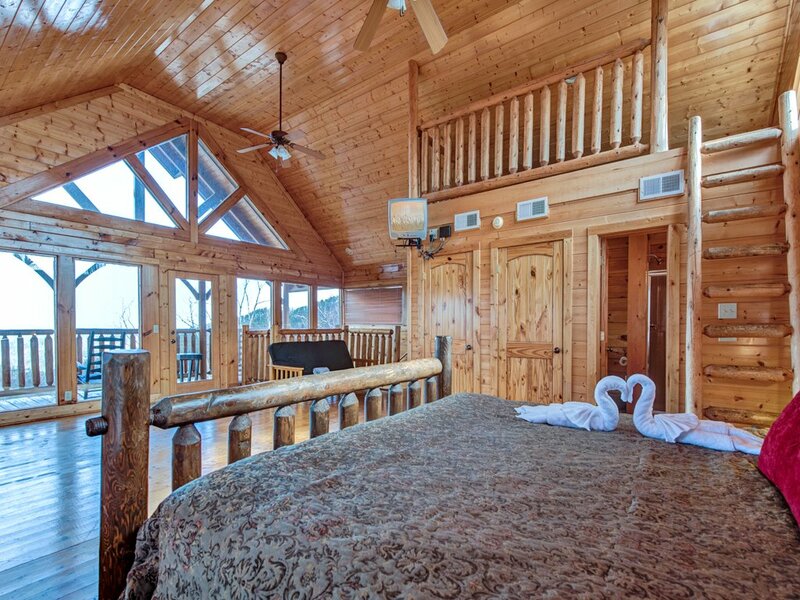 The cabin is beautiful and has creative sleeping arrangements. The drive is about 10 minutes to the main parkway. The living room furniture needs to be repaired or replaced due to huge seam rips in the upholstery, but was very comfortable. The hot tub outside was nice. 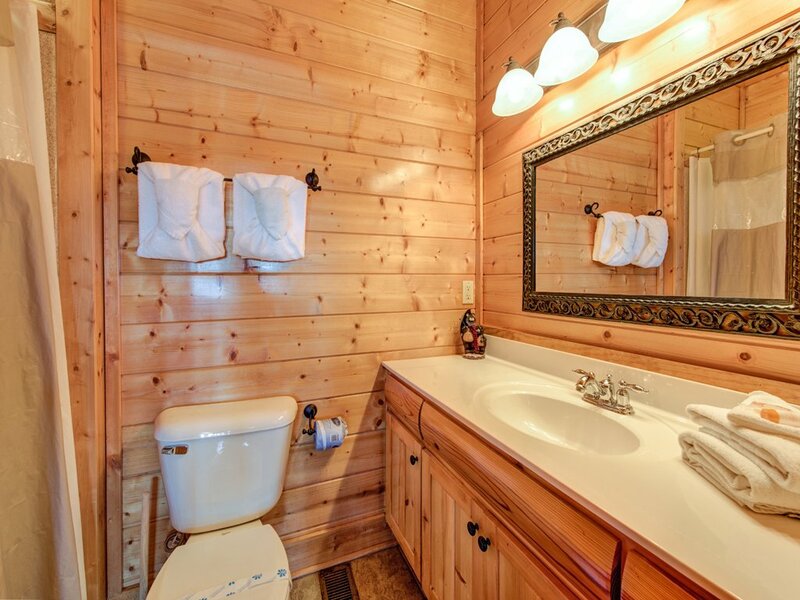 As usual with rental cabins, the hot water tank is not large enough to fill the jetted tub in the bathroom, but if you don't mind it lukewarm by the time it fills then you are good. The fireplace was broken. It lights up barely but if you turn the fan to it on, a loud screeching noise happens. the needed repairs did not hinder our fun, though. 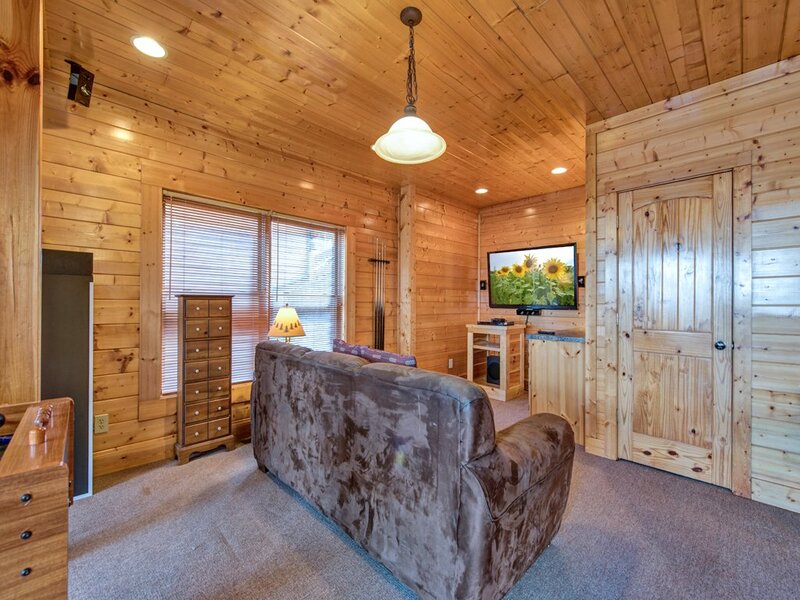 Just don't place your hopes on having a fireplace in a mountain cabin. We are thankful to have enjoyed it before the fires came to town! Beautiful location but not really for 16 adults!Was expecting better bedding - love seat, mats for two, bad futon, NOT really beds, but counted. Lots of room for air matt. upstairs and we used them. Also disappointed with electric fireplace that was too noisy to run. Thanks to great response from agency we got maintenance for the hot tub and stopped up drains that welcomed us. But the view made the crowding and other exp. worth it! 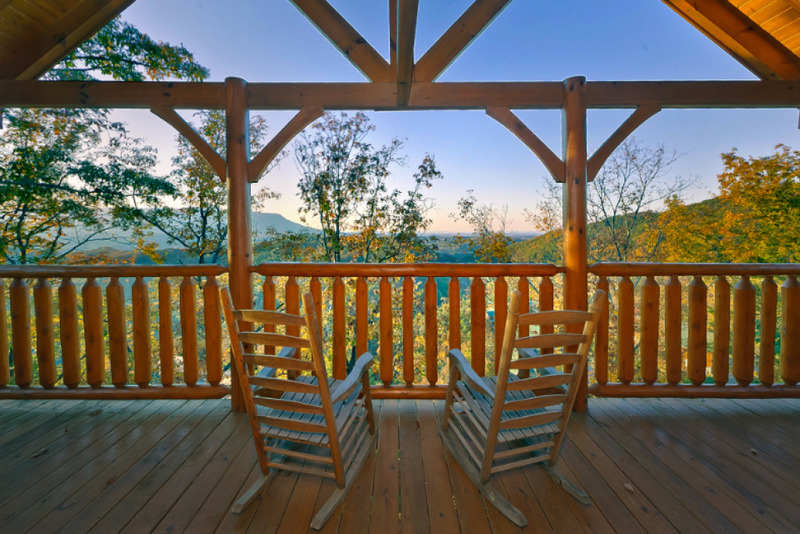 Thanks for your review of your recent stay at Rocky Top Retreat. We appreciate your four-star review and comments! We agree that this property is quite crowded at max occupancy (16), but are glad that you and the entire group were able to enjoy the view and time here. Come back soon! We appreciate your five-star rating and positive review. Come back soon! Overall a great stay. 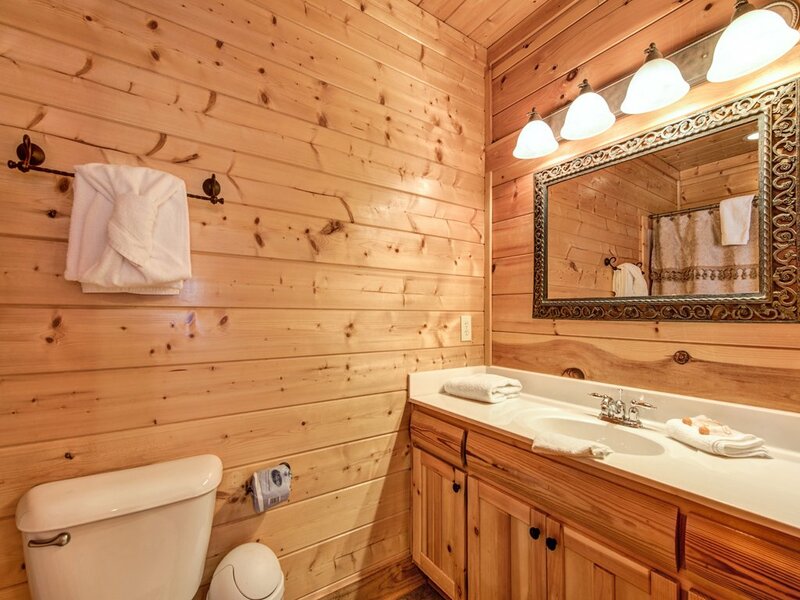 The only problems we experienced with the cabin was that the hot tub did not get warm throughout the stay and the washing machine had a smell. Although the parking was tight, the location was perfect. 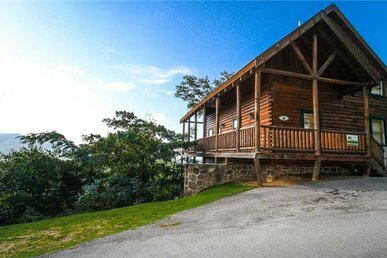 The cabin has amazing views and close to parkway. 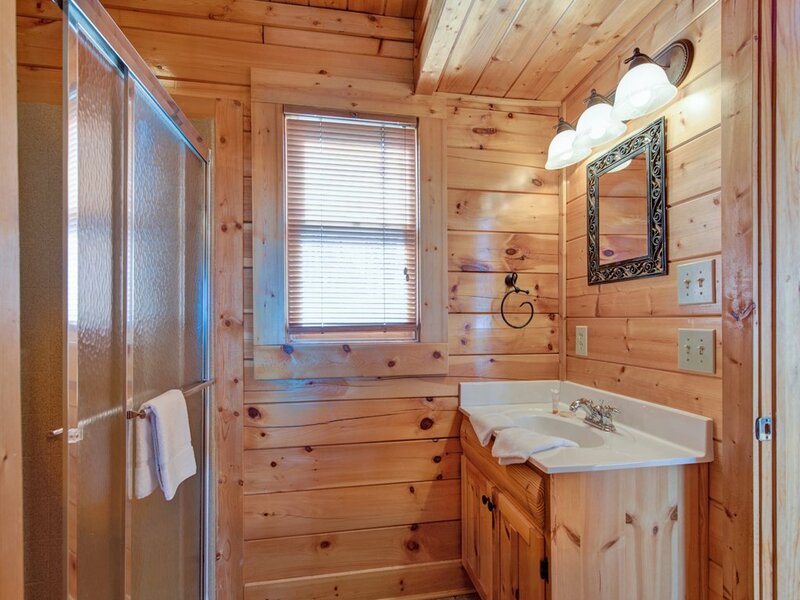 Lastly, the cabin was very clean. 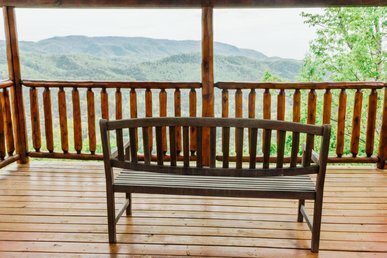 Thanks for the four-star review and mentioning that you had a great stay here at Rocky Top Retreat! We enjoyed hosting you and your group. After you check-out, we repaired the washing machine. The hot tub required a simple reset procedure. Thanks and come back soon! Enjoyable! 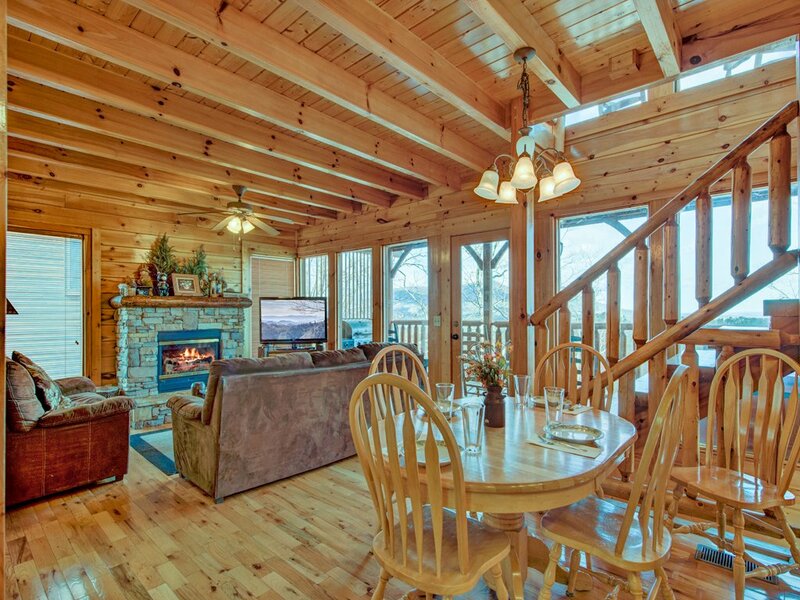 Cabin was just what we were expecting. Clean,modern, and a perfect view. Had a little problem with the third floor air but a phone call and less than a hour a man came and checked it and installed two room air units that worked great. Only regret I had about anything was not staying longer. Beautiful views nice and clean. Everyone in my family loved it will be staying again. 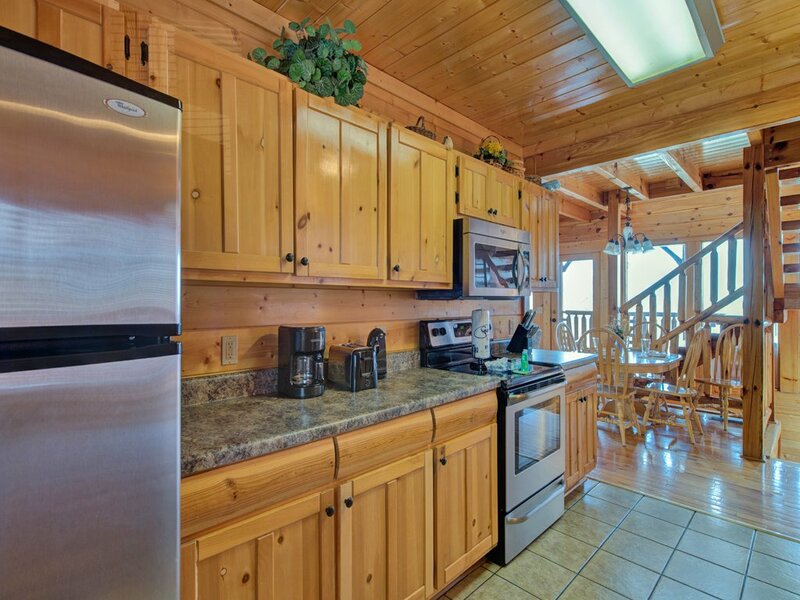 All rooms are clean and the rental property is at the top of the mountain. Loved the stay. We are 9 members and we had sufficient bed, sheets and all. Simply superb experience. Had a lovely vacation. Surely will plan again!!! Wonderful week in the smokies! 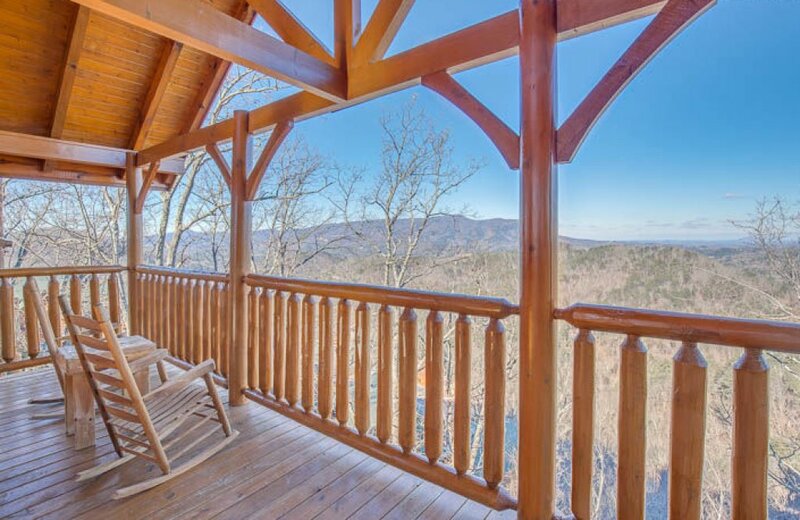 Rocky Top retreat was beautiful, the views were amazing! The house had everything we could have needed and was very clean. The nails on the decks are coming up and when walking around barefoot did cause some damage when steped on. Parking was a headache. The tenants in the cabin to the left had 11 cars and 0 regard for any of the homes around them. Maybe specifically assigned and marked spots would solve this problem. Overall the value was great and we really loved this home. Enjoyable. Kitchen could be better equipped. 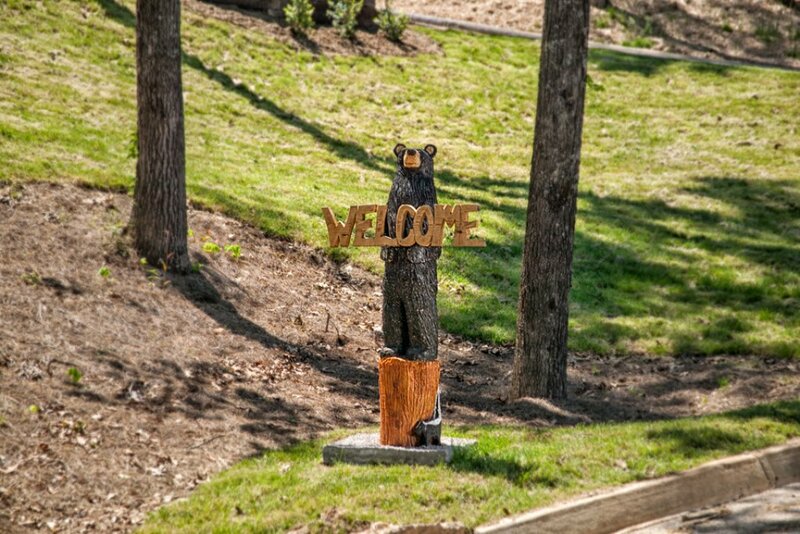 Thank you for choosing our company during your recent trip to the Smoky Mountains! We greatly appreciate the positive review and comments. We will update the kitchen with additional amenities - any specific items missing? Come back soon! 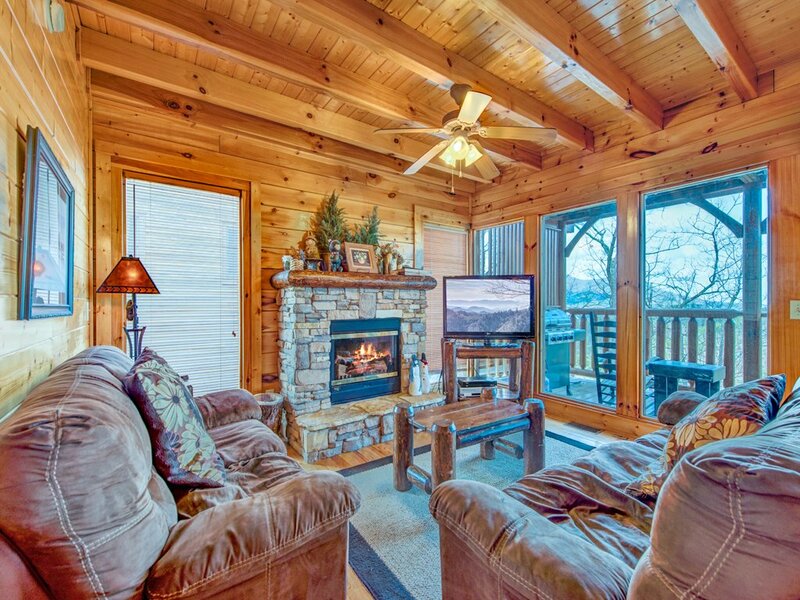 My family loved the cabin and we all enjoyed our stay that we are going to come back next great.